After surpassing the previous all-time high for the Dow Jones Industrial Average on Tuesday (and setting new ones almost every day last week), many eyes are now focused on the S&P 500 Index (SPX) which closed Friday’s session just 2.35 points below its October 2007 record closing level of 1,564.15. (It might be worth noting that the all-time intraday high was set at 1,576.09). That being said, it is also worth noting that long-term trend line resistance currently sits at the 1,600 level for the SPX. Another interesting point to observe is that the past two times the S&P 500 Index found major long-term trend line resistance (in March 2000 and October 2007), the “topping” price action came by way of a “process” that, in the end, produced what appeared to be bearish “head & Shoulders” patterns. Given this technical history, it would not come as a surprise if key trend line resistance were eventually hit in the next week or so, followed by a bout of price volatility. A number of prominent market observers have cited outflows from equity mutual funds in the past couple of weeks, which makes even the most optimistic bulls take pause and suggest that the market is ripe for a “correction”. Still, price momentum has held equity prices firm despite relatively low trading volume last week and then Friday’s “quadruple witching” session, which caused a spike in share volume on the final day of the week. The real question is whether the “buy-on-a-dippers” will step in and begin to buy on the much anticipated pullback. The “process”, which was displayed in 2000 and 2007, suggests that they will be …at least for a while. After which the “sell in May and walk away” mantra might ring out again. All of that said, what is not expected is a solid break above key trend line resistance at the 1,600 level. A “surprise” of that nature could be considered to be an anomaly given the odd set of “good news” handed to investors over the past couple of weeks. Those items include what appeared to be a bullish surprise in the employment data. When more closely looked at, those numbers included a drop of 77,000 full time workers and a rise in part-time jobs by 365,000. In addition, the employment “participation rate” fell to a 30-year low (see chart at http://research.stlouisfed.org/fred2/series/CIVPART/). Further, February’s unexpected 1.1% jump in retail sales included sharp gains in gasoline (whose price leaped by 9.1% and represented 75% of February’s retail sales rise), autos, automobile parts and groceries. That left “core retail sales” rising by only 0.4% when compared to January. What does all of this mean? It probably suggests that the 1,600 level on the S&P 500 Index should prove to be still resistance for now. 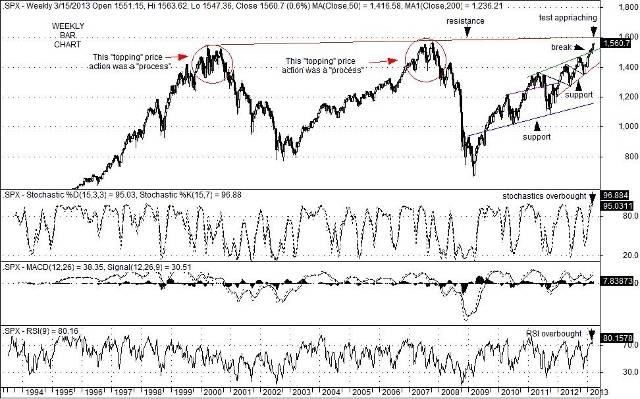 This entry was posted on Wednesday, March 20th, 2013 at 10:59 pm	and is filed under The S&P 500 Index (SPX). You can follow any responses to this entry through the RSS 2.0 feed. You can leave a response, or trackback from your own site. © 2019. Charted Territories. All rights reserved. Powered by WordPress & SimpleX theme.